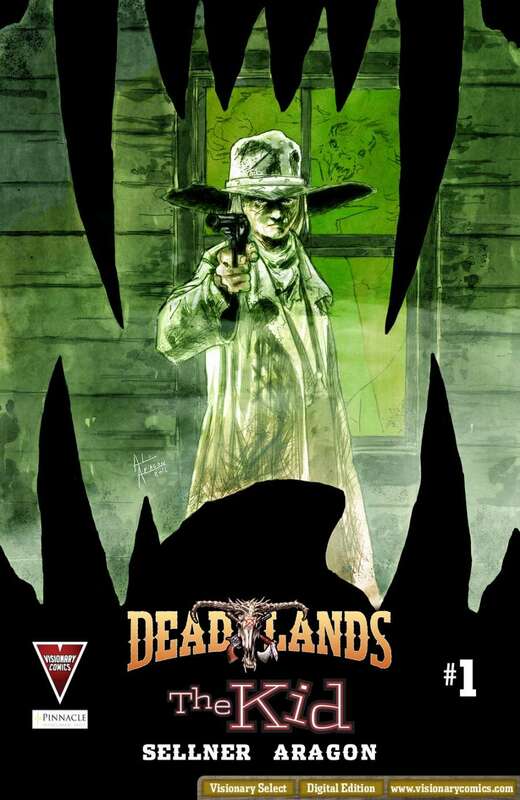 Visionary Comics brings the weird west world of Deadlands to full-color life with a series of comics by a variety of artists and writers. 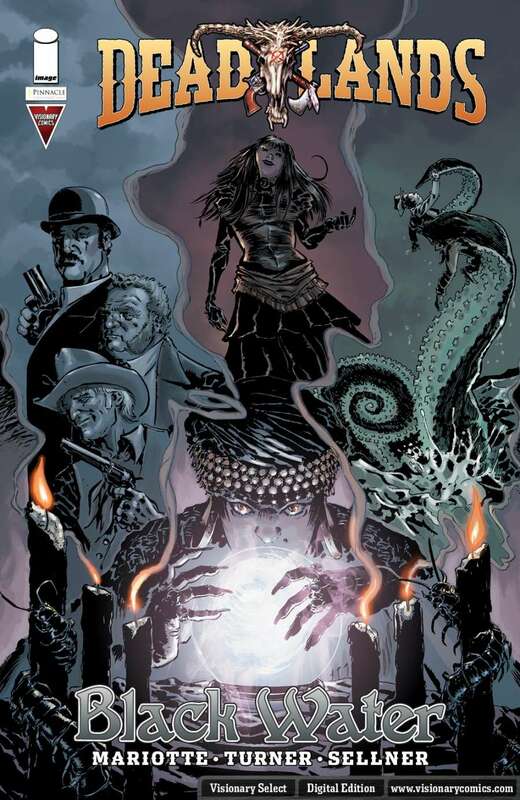 Five different issues featuring five different main stories combine to give readers the full-bore Deadlands experience. 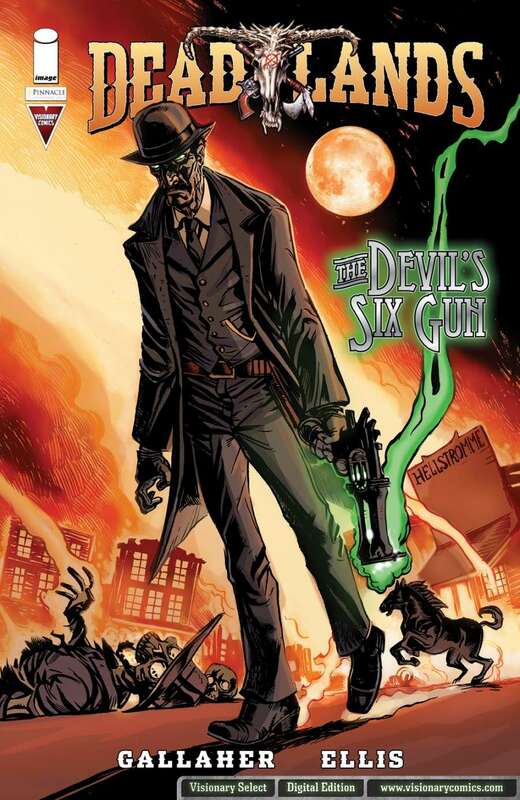 Combining elements of the classic Western with Steampunk – a fairly natural fit, as it happens – and horror, Deadlands offers a unique experience to gamers. It was only natural that such a two-fisted, four-color setting would make the jump to a more visual medium – comics. 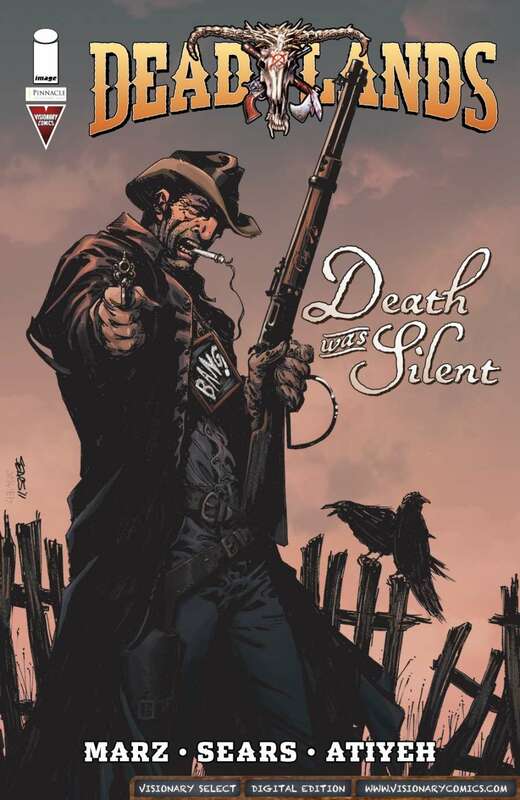 The Kid tells the story of Billy the Kid – Deadlands-style. Billy’s family is slaughtered by werewolves. He survives thanks to the intercession of local natives, and is mentored by a powerful medicine man. Billy takes up the mantle of revenge and hunts down those men/werewolves responsible for his family’s death. Story by C. Edward Sellner: illustration by Oscar Capristo. Ruthless businessman Harmon Rappaport is searching for the woman who saved his life years ago. Rumor has it she vanished into the Maze – the remnants of the shattered California coastline, now a long stretch of canyons filled with seawater and home to Maze Dragons – and worse. Mr. Rappaport and his able bodyguard find themselves a reliable guide to the Maze and book passage, but more than just a river journey lies ahead of them. Story by Jeff Mariotte: illustration by Brook Turner. A young Native American woman with ghostly white hair comes to town looking for someone. Her problem: the people holding the person she seeks don’t want to give her up. Their problem: the woman she’s searching for is her mother, and woe be to those who keep the two apart. Story by Jimmy Palmiotti and Justin Gray; illustration by Lee Moder. A bounty hunter rides into town. He speaks only using a slate hung around his neck. He never writes on it by hand; what he thinks shows up in stark white chalk letters on the smooth, black surface. The bounty hunter has a corpse draped over the back of his horse, and as he stops in town for a drink, the people of Dandelion Flats discover he’s there for more than just whiskey. Written by Ron Marz: Bart Sears did the illustration. Copernicus Blackburne was a gifted inventor. His particular genius lay in the field of munitions and weapons design. Samuel Tygian hears of this genius and hires him to build a very special gun, a gun to “kill the Devil.” What Copernicus Blackburne doesn’t realize is the lengths he’ll have to go to in order to achieve Tygian’s dream of creating such a powerful relic, and just exactly what he’ll have to sacrifice to reach that goal. Story by David Gallaher: illustrations by Steve Ellis. I found myself pleased with each of these stories in turn. All have a certain tragic element to them – the Weird West is a dangerous place after all and in such a setting life is often cheap. Some of these tales have happier endings than others, but for the most part the climaxes are open-ended, leaving plenty of room for the story to continue. All five stories feature some classic Western themes: a lone gunman, revenge, standing against long odds, obsession, and greed. 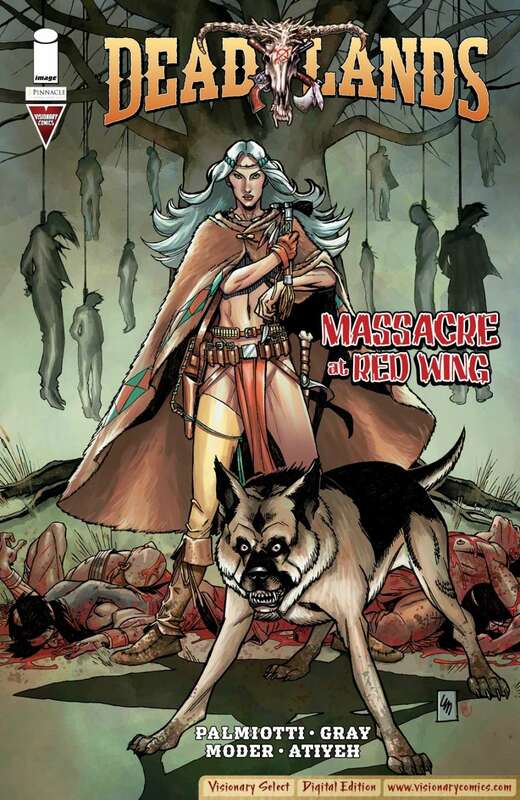 Available only recently in digital format, the Deadlands comics series is a sure hit for fans of the Deadlands RPG setting, Steampunk, Westerns and good horror yarns. These elements blend together flawlessly to create a unique setting with stories as universal as the oldest tales of heroes and gods, yet still fresh and original. Picking my favorite out of this group is a tough call. It’s a toss-up between Death Was Silent and Black Water. I liked the depth and complexity of the setting of The Maze from Black Water, and am intrigued at the possibility of more adventures with the hard-bitten Lyle Crumbfine and the citified but no less dangerous Ian Fairfax as they try to find their way back to civilization. In Death Was Silent, the mystery surrounding the Bounty Hunter Hoyt Cooper and his brother Franklin sucked me in gradually but powerfully. One day, Franklin will lose control and on that day, Hoyt will have the worst day of his life. I also liked that Lyle Crumbfine’s character stats and the Devil’s Six-Gun’s stats as a relic for the Deadlands RPG are included after the end of their respective stories. My hope is that they’ll continue little touches like that linking the comics to the RPG; it gives exposure of both the game and the comics to entirely new audiences, and for those outside of the gaming world it helps show what a good tabletop role-playing game session can be like. Using the Savage Worlds rules set means that Deadlands is already familiar to many gamers, and those who haven’t gamed in the Savage Worlds are likely to find its easy play style and focus on action rather than crunching numbers a welcome change from many popular game systems. These five stories aren’t as crude as someone’s Deadlands game converted comic book form, but they do include enough inspiring material to give a good GM plenty of ideas to flesh out many nights of thrilling gaming. Plus, they’re a fun, adventure-filled series and well worth the time and effort to find and enjoy them, even if you have no interest in Deadlands or gaming. After reading them all I’m looking forward to the continuation of this series.